We can place your ad into other states through similar programs as well – again with one easy order to reach a large area at deeply discounted rates. If this program doesn’t quite match your geographic needs, we can customize an ad placement order for you in multiple newspapers. We’ll take care of the work of dealing with varying column sizes, deadlines, etc. Another program available is the Minnesota Classified Ad Network – a 25-word ads runs in all participating papers for $279 per time ($10 each for additional words). Need an online component? 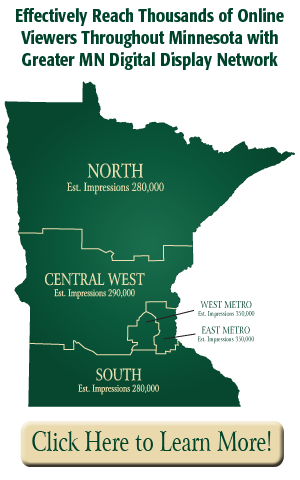 Minnesota newspapers also have an advertising program on their websites available – this may be ordered independently or combined with print. Please call for details, 320-485-2535. Campaign management: similar to placing an ad or series of ads for you, we have worked extensively in creating complete marketing campaigns using a variety of media and promotional tools (print, web, signage, direct mail, broadcast, novelty items, etc.). Again, please call to discuss the details and many options: 320-485-2535.